In my write-up of 1940’s The Devil Bat, I mentioned how the films of Bela Lugosi were like cinematic “comfort food” for me, how I always relish the chance to watch a movie the star appeared in, no matter how small his role might be. Well, “comfort food” is a good way to describe my feelings about the movies of Werner Herzog as well. 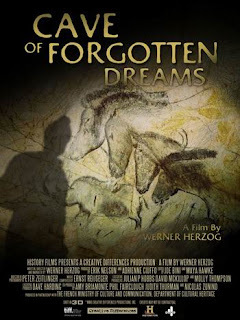 Whether documentary or narrative, I find Herzog’s work utterly fascinating, and his 2010 movie Cave of Forgotten Dreams is no exception. Taking us deep underground to observe drawings dating back some 32,000 years, Cave of Forgotten Dreams is, like most of the director’s films, an entirely unique experience. Located in Southern France, Chauvet Cave, which a trio of explorers stumbled upon in 1994, contains the oldest cave paintings ever discovered. Shortly after this remarkable find, the French Government sealed the area off, and has only allowed a handful of people to enter the cave, one of whom was director Werner Herzog. Joined only by his cameraman, a sound recorder, and an assistant, Herzog spent 5 days inside Chauvet (due to the buildup of gases, nobody was permitted to remain underground for more than a few hours at a time), capturing as many of these amazing images as possible. Like many of Herzog’s documentaries, Cave of Forgotten Dreams branches off in a number of different directions. Aside from presenting the paintings inside Chauvet, the film also covers some of the other archaeological finds made in the area, including primitive figurines carved from ivory. In addition, the movie delves into the geology of the region, wondering if there might be other caves not yet discovered. While these asides are interesting enough, Cave of Forgotten Dreams is at its best when showing the ancient images of Chauvet, some of which are extraordinarily detailed. Featuring a series of animals, everything from horses to cattle, these drawings are incredible, shedding light on a period of mankind’s history that’s seldom explored. Thanks to Werner Herzog, they’ve now been preserved for the ages. But then, Herzog has always been quick to turn his cameras towards the more astonishing aspects of our society. In fact, If I had to choose one filmmaker whose movies would be locked away in a time capsule for a few hundred years, thus giving future civilizations a look at what the cinema of today had to offer, I’d be hard-pressed to come up with a better candidate than Werner Herzog, whose filmography features historical dramas (Aguirre The Wrath of God, The Enigma of Kasper Hauser); horror (Nosferatu the Vampyre); war (Rescue Dawn); crime (Bad Lieutenant: Port of Call New Orleans); the indomitable human spirit (Fitzcaraldo); and the downright bizarre (Even Dwarfs Started Small, The Wild Blue Yonder). Along with his dramatic output, Herzog has created a slew of documentaries that present life in late 20th and early 21st centuries in a truly distinctive light, both short subjects (How Much Wood Would a Woodchuck Chuck) and feature-length (Grizzly Man), not to mention some that cross into the realm of adventure (La Soufriere, The White Diamond, Encounters at the End of the World). With such a diverse selection of movies to his credit, I can think of no one better to represent the “here and now”, showing generations to come what can be accomplished with a little imagination, a whole lot of guts, and a movie camera. I loved this movie. I'm an archaeology geek, which is part of it, but the entire concept of these paintings being so old is simply astonishing to me. It's the sort of film everyone should see. I suppose it helps that I like Herzog, too. I literally just watched this for the first time yesterday. I didn't consciously register that you'd covered it so recently Doc, but maybe I saw this review and it subconsciously started me on what I can only describe as a sudden Werner Herzog obsession. I love that you describe his films as "comfort food" because this felt exactly the same to me. That's not to suggest that there's not a huge amount of intellectual and philosophical depth to this film; The scope of historical illumination is staggering, but there's something about the meditative quality of Herzog's approach that is incredibly calming and endearing. I think he's great at contextualising the vastness and diversity of the human condition in a way that renders our own trifling problems quite insignificant. Such a beautiful movie.